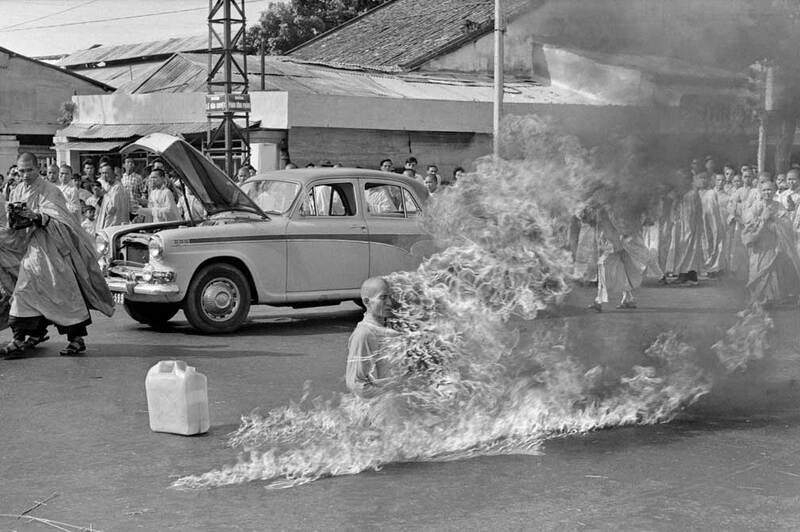 Buddhist monk, Quang Duc, sets himself on fire in protest against the Diem government's policies. Buddhist protests intensify daily. Demonstrations against the government continued as it refused to take any responsibility for the shooting in Hue. On June 11 a group of cars pulled up on a busy street in Saigon and an old buddhist monk named Quang Duc climbed out. He sat down on the street, crossed his legs and was encircled by other monks. One of them doused the priest in gasoline and started a fire with a lighter. The monk clasped his hands together as he was enveloped in flames. Duc’s entire body burned. Due had left behind a last words, asking the South Vietnamese leader to show respect for all religions. The photos spread around the world.